Endeavour comes down Martin Luther King Jr. Blvd. from Vermont Ave., about to make the turn on Menlo Ave./Bill Robertson Ln. on Oct. 14, 2012. LOS ANGELES — I'd spent nearly 15 hours waiting for space shuttle Endeavour to roll up to its museum retirement home, but now I didn't have a minute to spare. I had to go track the huge space plane down. I had staked out a spot near the California Science Center here — where Endeavour will go on display Oct. 30 — around 3:30 p.m. PDT Saturday (Oct. 13; 6:30 p.m. EDT/2230 GMT). The shuttle was supposed to chug into view between 6:30 p.m. and 8:30 p.m. PDT that day, so I figured I'd given myself a reasonable cushion. "Reasonable" grew into "ample," then "excessive," and finally "nearly unreasonable" as Endeavour met a series of delays on its unprecedented 12-mile (19 kilometers) journey through the streets of L.A. from the airport. It took longer than museum officials anticipated to squeeze the 78-foot-wide (24 meters) orbiter between the trees and buildings lining its urban route. A vendor cooks bacon-wrapped hot dogs outside the designated viewing lot near shuttle Endeavour's museum home on Oct. 13, 2012. First we heard that the shuttle would actually show up closer to 9:30 p.m. PDT. Then the arrival was pushed back to 11:30 p.m., then 1:30 a.m. And so on. But now it was 6:15 a.m. on Sunday (Oct. 14), and officials were saying Endeavour wouldn't be rolling into view for at least another three hours. That was a problem, since I had a flight back home to San Francisco at 10:20 a.m. So I hit the streets, walking west down Martin Luther King Boulevard to meet up with the laggard space shuttle. A small crowd had already assembled near the museum by the time I showed up Saturday. And it grew as the afternoon wore on, with people sitting in camp chairs beneath big shade trees and lounging in the grass outside the neighboring Natural History Museum of Los Angeles County. By 5:00 p.m. or so, it had swelled into a crowd of hundreds, most of whom milled around patiently, many of them parents with young children. One such family was the Gonzalez clan — Mike, his wife Naomi and their 11-month-old son Michael. They'd watched Endeavour fly over the City of Angels atop a 747 carrier jet on Sept. 21, the day it landed at Los Angeles International Airport after a cross-country farewell tour. 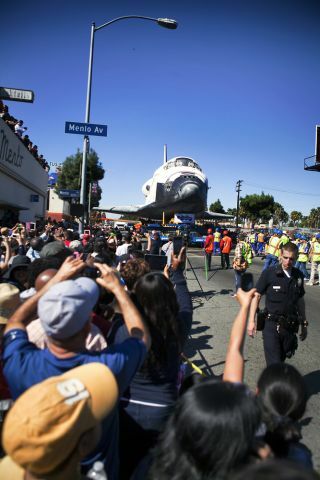 And they saw the shuttle roll through Inglewood on Friday (Oct. 12), the first day of its overland trek to the museum. "We want to finish it," he told SPACE.com. "This is history." At about 5:30 p.m., onlookers were herded into a huge, empty parking lot just west of Los Angeles Memorial Coliseum, where the University of Southern California plays its home football games. Endeavour would cruise right past this lot on the home stretch of its journey. By nightfall Saturday, the lot looked like a cross between a block party and a street fair. Kids ran this way and that, waving glowsticks and playing ragtag games of pickup soccer with empty plastic soda bottles. Adults sat in camp chairs eating pizza or bacon-wrapped hot dogs, which a man with a small food cart was grilling up just outside the lot. A stand staffed by California Science Center volunteers sold Endeavour merchandise, but a few enterprising folks strolled through the crowd hawking unofficial-looking shuttle T-shirts. Other entrepreneurs were offering 8X10 photos of the shuttle's L.A. flyover for $10 each. A crowd waits for shuttle Endeavour in a designated viewing lot near its museum home on Oct. 13, 2012, the day it was originally scheduled to arrive. The cops made the announcement about the 1:30 a.m. arrival at around 8:00 p.m. Saturday night. The news spurred a mass exodus of families with young children (including Mike, Naomi and Michael Gonzalez), cutting a crowd of 1,000 or so roughly in half. But as moms and dads pushing strollers went out, some hardy souls trickled in, fortified with food, coffee or both. Jason Palermo was one of the determined ones. He came back to the parking lot after a coffee run, along with his parents and his girlfriend. "Why would you go home?" Palermo asked. "This is a once-in-a-lifetime opportunity." I'm not sure whether Palermo and his group powered through all of the ensuing delays and spent the night in the viewing lot. But I didn't see them among the two dozen or so folks waiting in the lot when I walked by it at 6:15 a.m. Sunday morning. For the record, Endeavour actually rolled into view of the California Science Center around 11:30 a.m. PDT Sunday (2:30 p.m. EDT; 1830 GMT) and reached the threshold of its hangar roughly 2.5 hours later. The rising sun bathes space shuttle Endeavour in a golden glow as it rolls down Martin Luther King Jr. Boulevard on Oct. 14, 2012. To meet up with Endeavour on Sunday, I headed south on Vermont Avenue, then hung a right on Martin Luther King after pausing briefly to snap a picture of the Vermont street sign lying on the ground. (Many streetlights, signs and power lines had to be temporarily removed along the shuttle's route to let it squeeze through). Though dawn was still about 45 minutes away, some people were already camped out at this intersection, waiting for the shuttle. The crowds grew larger and more boisterous the farther I walked down Martin Luther King. By the time I caught up with Endeavour, around South Van Ness Avenue, I was surrounded by perhaps a thousand people, some of them still wearing pajamas and rubbing the sleep from their bleary, red-rimmed eyes. A few, however, sat in lawn chairs drinking beer, perhaps continuing the party from the night before. The sun rose and bathed the shuttle in soft golden light as I stood there slack-jawed and sleep-deprived, trying to wrap my mind around the spectacle I was witnessing. Endeavour — an American icon that flew 25 space missions from 1992 to 2011 — was rolling down the street just yards away, cruising past mini-markets and laundromats. "Surreal" was the first descriptor that popped into my head. And the sight was indeed surreal, but it was so much more as well — incredible, communal, inspiring, joyous and tremendously sad all at once. I'll remember it for the rest of my life. Editor's Note:If you snapped any photos of Endeavour during its trip through L.A.'s streets and want to share them with SPACE.com, send the pictures, comments and location info to managing editor Tariq Malik at tmalik@space.com. Follow SPACE.com senior writer Mike Wall on Twitter @michaeldwallor SPACE.com @Spacedotcom. We're also on Facebookand Google+.